The 2nd generation CST Auto Bolt Stop functions with the Power Custom Match Bolt providing the world's only last shot bolt hold open function for 10/22* rifles. Last shot bolt hold open eliminates the need to “count your shots”, the final discharge will have a distinctive sound and recoil impulse that will immediately relay that your rifle is empty. The 2nd Gen Auto Bolt Stop components are precision wire-EDM manufactured with all bends carefully completed by hand, then heat-treated to spring temper for a lifetime of use. Every 2nd Gen Auto Bolt Stop is assembled and tested for correct function in-house, one at a time. Carefully following the directions of Ron Power of Power Custom, the Power Match Bolt is truly a match quality component and is an excellent upgrade over the mass produced MIM "cast" factory bolts. They are CNC quality bolts designed to be light weight to cycle standard velocity match ammunition, include a Power Custom titanium firing pin and extractor, have a cross pin installed for precise firing pin strikes, and have a tight tolerance .0425" headspace. They are 4-axis CNC machined with precise geometric tolerances from hardened 416 stainless steel for a lifetime of use. The firing pin and extractor are pre-installed, allowing drop-in installation of the bolt, (uses factory or factory compatible aftermarket charging handle). 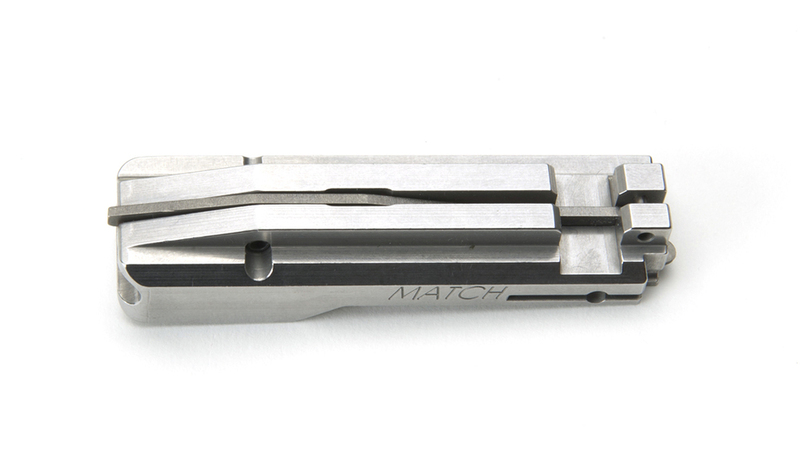 The Power Custom Match Bolt incorporates unique features that allow the CST 2nd Gen Auto Bolt Stop to function, (factory bolts and all other aftermarket varieties do not have the correct design features). Although Power Match Bolts are sold individually and are fully compatible with factory configured 10/22's*, they are designed with correct clearances and a special pocket along the bottom, both features allowing the function of the new CST 2nd Gen Auto Bolt Stop providing a last shot hold open feature. With or without the CST 2nd Gen Auto Bolt Stop, the Power Match Bolt is finding it’s way more and more into the winning circle in rimfire competitions, providing an exceptional improvement in accuracy. The 2nd Generation CST Auto Bolt Stop is available as a kit including the Power Match Bolt, a 10% savings over purchasing the items separately! The CST Auto Bolt Stop holds the bolt open on the last shot and will function in either aluminum or polymer trigger housings, and will function in Ruger's* latest take-down model 10/22*. The unique "passive activation" design will automatically stop the bolt unless a loaded magazine is in battery. Once a loaded magazine is inserted, the bolt is simply pulled fully rearward and released to load a cartridge into the chamber, much like "automatic bolt releases". A manual bolt release tab is located by the magazine release to close the bolt on an empty chamber. Bolt locks, "automatic bolt releases", and the ejector are removed from the trigger assembly upon installation of the CST Auto Bolt Stop. Installation instructions are provided and does not require any permanent modifications to the rifle. CST proudly offers quality Power Custom products to complete your latest custom build. If you are interested in our latest innovations for the 10/22* including our full product line, please feel free to visit our web STORE!